Back in 1997 my Aunt Mary took my sister Nanci and I on the trip of a lifetime to Italy. We were very excited about this as both our father and our maternal grandparents came from this beautiful country, and we had always wanted to visit. 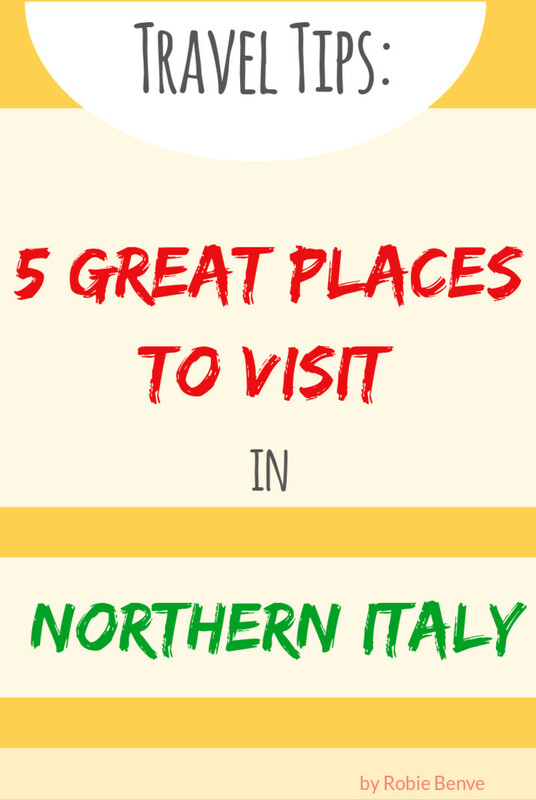 This hub is a continuation of Visiting Italy - Rome to Venice & Back - Part 1. Back on the bus again, and with the morning rapidly moving along we now found ourselves heading for Siena. Siena is yet another Etruscan hill town founded in and around 900 BC. Afterwards it became inhabited by a tribe by the name of Saina. However, according to legend Siena was founded by Seinus, son of Remus who was the brother of Romulus for whom Rome was named. This Roman connection accounts for the town's official emblem of a she wolf suckling the twins, and many statues of this can be seen throughout the town. My first impression of Siena as we were approaching was that this was a much larger town than any we had previously been in, with the exception of Rome of course, and on approach from a distance everything looked an earthy golden colour - aptly described by the name of the town itself. Heading for the main streets of Siena we noticed once again, as with the other towns, how incredibly clean everything was. We took in a lot of the buildings along the way and note of a deli that we might like to have a cafe latte in if time allowed, but of course we were in a hurry to reach the main square which we had been told much about on the bus. 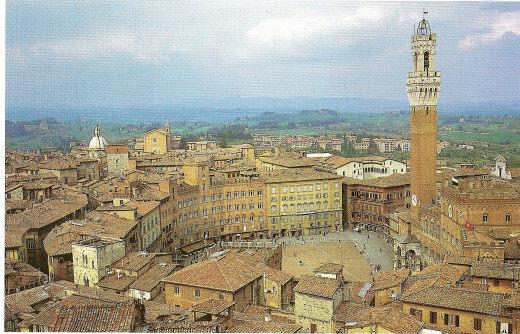 Piazza del Campo is known as one of the most beautiful civic areas in Europe. A place that once served as the site of a market and went on to host many sporting events, one of them being the medieval Palio Horse Races. These races are run twice a year in July and then again in August, and the horses and riders literally race around the square. As we entered down a sloped road, then through a gate and got our first view of this huge shell shaped arena that slanted down toward the middle, we could only imagine what a sight that must be and were immediately sorry that we would have missed this event by only a few weeks. What we saw in front us were people all around literally sitting on the slanted cobblestone sides, taking in the sun and just generally relaxing. All around the square we were surrounded by a wonderful combination of Gothic and Romanesque architecture. So we just took our time, strolling about, and generally living the moment. We were in no hurry to go elsewhere at this point. Nanci was wandering around on her own snapping black and white photos to her heart's content and after a while my aunt and I felt like we needed to sit down for a bit to rest our feet. We quickly found out why so many people were sitting around on the cobblestones. You cannot sit on any of the many empty chairs in front of the buildings without ordering food, and along with that, in this particular place where we sat down there seemed to be a minimum charge. When all we wanted was maybe a slice of pizza and a cold drink, we ended up having to order a whole Margherita Pizza - each!! One really had to wonder if the fellow was just intentionally not understanding us, but in the end we just went with it. As we sat there we took in the view around us. Beyond one of the buildings we could see the Duomo's striped black and white bell tower, and thought about what a wonderful view we would get of the whole of Siena if we were to climb that tower. We quickly discarded that thought given our level of energy at that point and with the alloted time left to us. So with the approach of my sister Nanci we decided it was time to leave Piazza del Campo and take in whatever else we could on the way back to the bus. We wandered in and out of shops along the way, and at the end of the road just before the square that holds Palazzo Salimbeni, where we would meet the others on our way to the bus. We sat on the ledge just outside of a beautiful flower shop and reflected on what we had seen and just how much we enjoyed. And not for the first time I had the thought that I would return next year with my husband Craig. Back on the bus, and in our front row seats once again, we readied ourselves for another trek to the countryside heading this time for Florence, which would be our stop at the end of the day. But not before we made a stop in Chianti for a wine tasting experience at the Verrazzano Castle. I have to tell you that I was very excited about this! I could not imagine coming to Italy and not having a wine tasting experience somewhere along the way. My Aunt Mary as I mentioned earlier, strangely enough being Italian, was not much of a wine drinker; and while Nanci would have a drink of wine, she could either take it or leave it. I recall that on our second night in Rome, without the rest of the group, I wondered if I was going to be the only person in my little group drinking wine and would I bother on my own. But then Nanci had turned to me and said "what do you say, how about a half litre of red wine?" I say "Yes, thank you very much". So in any event I was probably looking more forward to this next little treat than they were. In the end I know they enjoyed it just as much. Along the way Nicoletta informed us that this area we would be entering was also often referred to as "Chiantishire" because of all of the English folks who had taken up residence in this part of Italy. She also explained a bit about the winery Castelo di Verrazzano, in that we would be met by a gentleman who would take us first on a tour of the grounds, and then the winery after which we would have our official tasting. We also learned that Giovanni da Verrazzano who was born in this castle was the explorer who landed in the area between Staten Island and Long Island, New York and thus the bridge that was named after him - the Verrazzano Bridge. As we drove along we noticed the countryside changing to a lovely rolling landscape surrounded by wonderful looking vineyards. Nicoletta informed us that this was the famed "wine road" noted particularly for the scenic beauty we were seeing all around us. 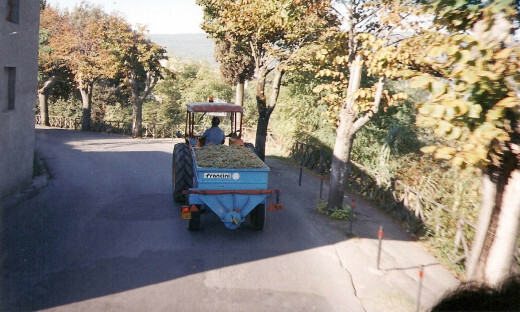 For about an hour we wound in and around this narrow wine road passing through Greve and on towards Chianti when all of a sudden we rounded a corner and there in front of us was a small tractor pulling a wagon loaded with beautiful green grapes. What a sight! Some of our fellow passengers took turns carefully coming up to the front to take a photo, while Nanci and I happily took our photos from the very best seat in town. Not long after that we caught sight of the ancient castle sitting on the horizon, with the ever present rows of cypresses all around it. The landscape surrounding it was literally breathtaking. And what made us extremely happy was that Nicolleta announced right at that moment that we would be spending a few hours here as we had nowhere else to go afterwards, but our destination hotel in Florence for the night. This was well planned to be a perfect afternoon ending to a very busy day. Once off the bus we were introduced to our guide who was waiting to take us around the grounds and tell us a little bit more about the castle itself. Standing in the courtyard surrounded by beautiful gardens and water fountains, he steered us to the edge of the property looking down into a ravine where he said we might be lucky to see wild board - and so we did! Planned? or not? Doesn't matter, it was still neat to see. Wandering over to the terrace overlooking the castle's vineyards and massive estate, I will never forget the view beyond with vineyards up and down slopes of one hill after another, and off in the distance one could see an amazing looking villa at the very top of one of the surrounding hills. To add to this, the sky was a beautiful shade of blue with not a cloud in sight. A more perfect day you could not wish for. Entering into the first reception room of the winery we were met with the most amazing "wall of grapes" hung up to dry just the day before we arrived - with a sign "Vino Santo uve Trebbiano Toscano" and we were told that these grapes would hang there until January 6. This was, if my memory serves me correctly September 18th. From here we went through the winery and toured the actual making of the wine. From there we continued into the heart of the castle and wandered down a flight of narrow stairs surrounded by old stone walls that date back to the year 1100. At the bottom we followed him through room after room filled with huge barrels of wine, all the while surrounded by the heady aroma of both the wine and the wooden casks that it sat in. We also found out that they produce olive oil and this was not too much of a surprise given the number of olive trees that we saw as we were driving up the lane to the castle. With the end of our wine tour we all ended up in the gift shop, very strategically appointed so that we could not miss it. This was all OK of course because here is where I wanted to buy a special bottle or two of wine for Craig. Immediately afterwards we all hurried off to join everyone for our wine tasting never expecting what awaited us. Once outside the gift shop we were led to another room outside of the castle with wide open windows and doorways to let the beautiful day in. Inside round tables of eight were set up with tablecloths, china and wineglasses. We had no sooner sat down when out came a bottle of red, a bottle of white and a bottle of desert wine for each table, followed by a platter of antipasto. This consisted of course of samples of the wild boar cacciatore, along with several other meats, cheeses, olives and baskets. of bread. We thought we'd died and gone to Heaven!! Never did I expect this kind of wine tasting; I literally thought they'd give each of us maybe half a glass of a few different wines and then we'd be on our way. But no, we were treated as though we had come into a restaurant to eat and drink and while away a couple of hours, and that's exactly what we did. At our table were two ladies from Brooklyn, a lovely couple from San Diego and one of the six couples from Indiana, along with we three Canadians, and we all did ourselves proud. We were told there was no rush and that we were there to relax and enjoy ourselves. If the platter was emptied, another one appeared. The same went for the wine. Verrazzano Castle and the Chianti Region did themselves proud and it was something that I would definitely recommend to anyone traveling to Italy. Before leaving, I stood there on the deck once more to take in more of the magnificent scenery, hoping to etch it into my memory. As I looked over to that huge villa on the top of the mountain opposite I wondered who could possibly live there, and what must it be like for them to look over at this beautiful ancient castle. Looking down I soaked in the sight of row after row of perfectly aligned vineyards, and before boarding the bus once again, I stood for a while in the midst of the beautiful olive trees. Back on the bus I reflected on what an absolutely perfect day we'd had , topped off by being wined and dined, and now we were ready to get to our hotel in Florence. No doubt we would sleep well tonight and be ready for whatever adventures tomorrow would bring us in Florence. TIP: We learned on this excursion when buying a bottle of Chianti, to look for the black rooster on the band surrounding the neck of the bottle. This signifies the best Chianti. 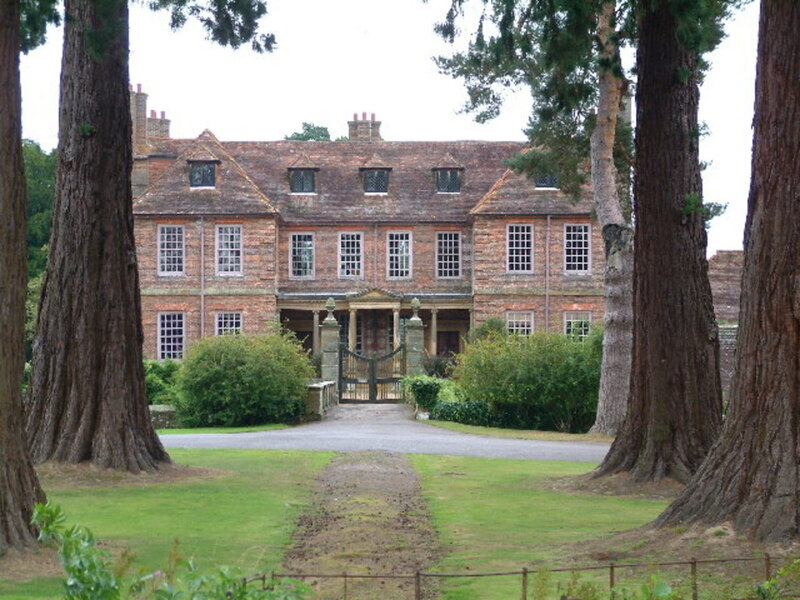 Please check out Part 4 of this series by the same name - to read about Florence.